An Annotated International Bibliography . 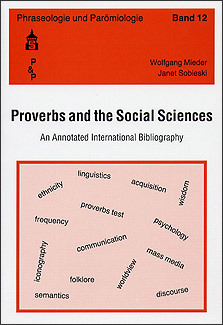 This annotated international bibliography on proverbs and the social sciences contains 1169 publications in many languages from around the world. It enables scholars of the various social sciences to have the most important proverb scholarship relating to their disciplines at their fingertips. There are many entries for anthropology, ethnography, folklore, linguistics (neuro-, psycho-, and sociolinguistics), pedagogy (education and teaching), political science, psychiatry, psychology, and sociology. But the same is true for art (iconography), communication (mass media), history, law, literature, medicine (health), philosophy, and religion as they relate to aspects of the social sciences. Most of the books, dissertations, and articles listed in this bibliography are characterized by an interdisciplinary and comparative approach to the study of proverbs. In addition to the key-word annotations for each entry, there are also comprehensive name, subject, and proverb indices. The bibliographical entries in this volume on Proverbs and the Social Sciences bear witness to the truly impressive scholarship of paremiology and phraseology (excluding collections).